In 2018, Food & Wine named this recipe one of our 40 best: Whenever a recipe is tested at F&W, the team gathers round to sample and discuss it. This unassuming salmon didn’t really grab anyone’s attention while it sat on the table, but once it was tasted, everyone paused and quieted. It was disarmingly simple but perfect. 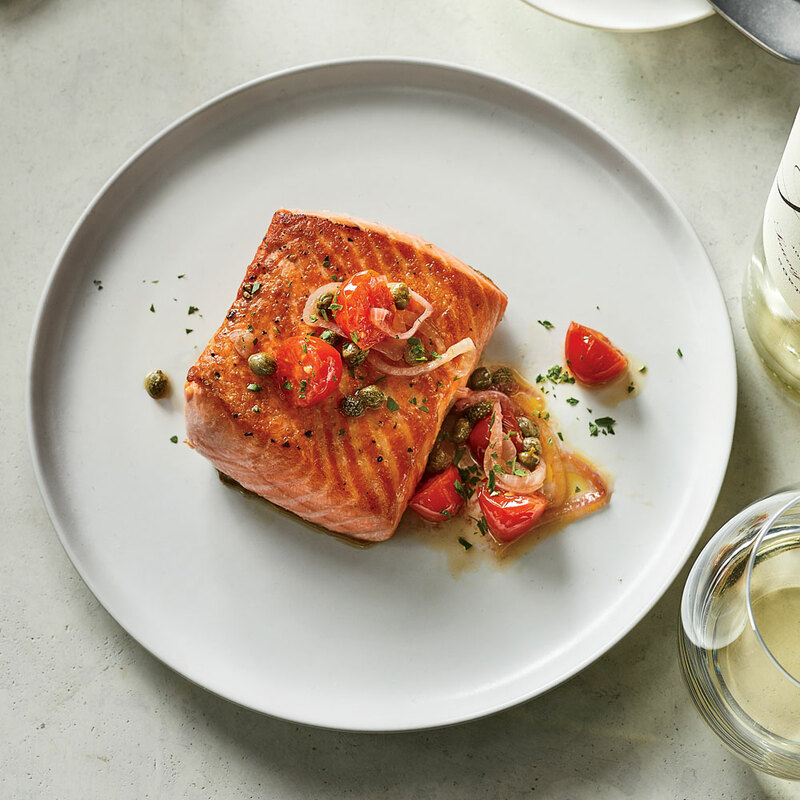 To make it, Ted Allen, TV personality and host of Food Network’s Chopped, sautéed sweet grape tomatoes with capers, shallot, and cumin, then spooned the bright, chunky sauce over crisp salmon fillets. It’s easy and quick and makes the quintessential weeknight dinner. Preheat the oven to 425°. In a bowl, toss the tomatoes with the shallot, capers, vinegar and 1/2 teaspoon of salt. In a medium ovenproof skillet, heat 1 tablespoon of the olive oil. Season the salmon with salt and pepper and add it to the skillet, skin side up. Cook over moderately high heat until well-browned on the bottom, about 3 minutes. Carefully flip the fillets. Transfer the skillet to the oven and roast until the salmon is cooked through, about 7 minutes. Transfer the fish to plates and pour off any fat in the skillet. Place the skillet over moderate heat and add the tomato mixture along with the cumin, canola oil and the remaining 2 tablespoons of olive oil. Cook, scraping up any bits stuck to the skillet, until the tomatoes just soften, about 2 minutes. Pour the sauce over the salmon, sprinkle with the parsley and basil and serve right away. Argentinean rosés, with their emphatic, berry-driven flavors and lively structure, are ideal here.